Differences in air pressure drive the winds. When tropical-cyclone winds exceed 73 mph, those winds are called hurricanes. Hurricane wind velocities can exceed 150 mph and may spawn tornadoes. Tornado winds can exceed 200 mph. On average, 700 tornadoes occur over the United States annually, more than over any other continent. Flying debris from strong winds poses serious hazards. Bimal Paul, professor of geography at Kansas State University (home state of Dorothy, the Tornado Riding, Hallucinating Farm Girl, and her dog, Toto), last year said that the U.S. should expect the nation’s weather severity to increase. So far, his “premonition” has been holding true, if the plethora of home-shredding weather is any indication. No need to panic yet, though; Paul does not believe that weather severity has significantly increased in recent years, but he does think that the trend may change in the next 20 years. Kites and dust storms are dependent upon wind to fly. The Chinese effectively use kites to fish over the oceans, dangling a fish line and bait from the bottom of a kite flying far and high over the water. The Sauls Barrage Kite originally was used to lift and display banners over public gatherings as early as 1938, and subsequently found gainful work as an anti-aircraft device during World War II. In the early ‘40s, the U.S. Navy requisitioned 3,300 of these kites for a mere $543,000, primarily to protect merchant ships. This begs the question: Are Somali pirates easily spooked by kites? Kites have been used in ancient Japan for psychological warfare. The Japanese hung bells and gongs from kites flown at night over enemy encampments, expecting to frighten enemy soldiers into believing that invisible evil spirits were on the attack. Koreans communicated with troops using signal kites to coordinate battles. Europeans deliberately crashed kites onto enemy targets, then measured the length of the kite string to gauge catapult settings for optimal projectile launches. Various photographers snap photos using “kite aerial photography.” One such photographer claims that the average Joe can assemble a kite aerial photography assembly for under $200. Wind helps windows fly also, as was the case with the Boston John Hancock building in the ‘70s. Flying windows have been a common hazard in the “Windy City,” Chicago, Illinois. Windburn can be painful, and wind-chill factors in Milwaukee on January 10 and 17, 1982, dipped to -80 F.
Lieutenant Colonel William A. Rankin, on July 26, 1959, bailed out of his crippled airplane into a thunderstorm. The wind extended an expected 10-minute fall into 40 minutes. The colonel survived, but not without being repeatedly being pummeled by hail at extreme heights; getting tangled in parachute cords due to up drafts and down drafts; and suffering frostbite. To say nothing of his nerves, overall. Other pilots have bailed out of airplanes in similar meteorological conditions, some surviving but most perishing due to extreme cold and lack of oxygen at altitude. Compensate for wind in outdoor activities such as golf, tennis, and Frisbee™. And when parachuting from crippled airplanes in the midst of storm clouds. Hector Berlioz, in “Fantastic Symphony,” uses a series of kettle drums to mimic the rumble of thunder. Thunder is caused by rapid expansion of gasses from the lightning bolt piercing the air. Corona discharges are electrical discharges emitted from pointed objects moments before lightning strikes in the area. These discharges emit a distinct sizzling sound and have little to do with the aftermath of drinking too much lime-stuffed, highly hyped, watery Mexican beer on pristine beaches. Some airline pilots wear sunglasses while flying at night through electrical storms. This conveniently reduces the periods of blindness caused by the eyeball-searing flashes. Lightning accounts for about 200 deaths in America annually; hurricanes and tornadoes together claim about 190 innocent bystanders and storm chasers. He adds that about four million lightning strikes occur on Earth every day, “resulting in a total worldwide power of more than 100 billion watts.” Dwyer says that if this energy could be captured, it would supply a significant portion of the power needs of the United States. Imagine: after we burn up all the fossil fuels in a few years, we could convert all those tanks, at the gasoline tank farms, into giant capacitors, and use the blood-for-oil greed heads as lightning rods to draw the energy to those capacitors. Ball lightning is rare and much more slow-moving than lightning. Ball lightning has been reported in sizes ranging from golf ball to as much as 8 feet in diameter. Ball lightning is often seen ambling leisurely (in the speed-realm of lightning strikes) along power lines and telephone lines, which is one reason you’re advised to avoid the telephone during electrical storms – lest you get an earful. Of bright, juicy electricity. Andy Freeburg’s car got hit by lightning while he was driving during a thunderstorm one night on a Minnesota highway. “It hyper-heated the air in the tires and blew all four at once, and all the wiring in the car was fried. The whole car just went dead all at once. I had to fight the insurance company because they were claiming ‘act of God’ and didn’t want to pay for such extensive and expensive repairs.” Freeburg survived the ordeal unshocked – other than, perhaps and understandably, emotionally. A person struck by lightning is usually knocked unconscious and stops breathing. Protect yourself from lightning as you golf, or during any outdoor activity, by taking shelter indoors or in a car. If you must, crouch down, feet on the ground. Lying on the ground only increases the area through which electrical energy can find and kill you. Cumulonimbus clouds are tall, anvil-shaped clouds that indicate rain and, often, hail. Hail forms in the cold, strong updrafts characteristic of rain clouds. Hailstones, sometimes the size of baseballs and larger, come from rain clouds. On April 12, 2012, baseball-sized hail stripped siding from homes and broke windows in northeast Nebraska, while tornadoes spotted in Kansas and Oklahoma had forecasters warning residents in these areas to prepare for “life threatening” weather. The National Climate Extremes Committee reports that a hailstone that fell in Vivian, S.D., July 23, 2010 is the nation’s largest on record so far. The hailstone was roughly cantaloupe-sized, at 8 inches in diameter and weighing 1.94 pounds. Prior to that, a 7-inch diameter stone fell in Aurora, Neb., on June, 22, 2003, ; and before that, a 5.6-inch diameter, 1.67-pound stone landed in Coffeyville, Kan. on Sept. 3, 1970. On the Plains in the U.S., they cause hundreds of millions of dollars’ damage for America’s farmers. Hailstorms have been lethal in Bangladesh. 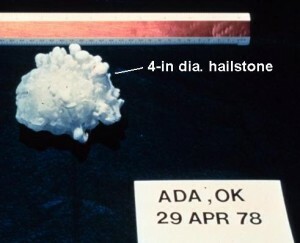 The world’s largest recorded hailstone was 2.25 pounds and plummeted into Bangladesh on April 14, 1986. Hail.org reports 12 hail storms in five states on April 13, 2012; 85 hail storms in five states on April 14, 2012; and 13 hail storms in four states on April 15, 2012, with 4.5-in. diameter hail in Riley, Kan., and 2.75-in. diameter hail in Clay, Neb. Snow plows were required to clear away muddy piles of nickel-sized hail that accumulated up to 4 feet deep on parts of the Texas Panhandle on April 11, 2012. Meanwhile, Fox News says global warming is just a ploy from academic-types to get more grant money. Ludwig Beethoven, in his “Sixth Symphony,” portrays the atmosphere of a spring day and the gradual development of a thunderstorm. Chopin wrote the “Raindrop” prelude (Prelude no. 15). Floods can be divided into two classes: Those caused by prolonged rains, and “flash floods,” resulting from shorter periods of very heavy rains. In the late 1980s, the National Water Resources Council estimated that annual flood damages in the U.S. would average $3.5 billion by the year 2000. The National Oceanic and Atmospheric Administration’s National Weather Service reports flood damages (adjusted to 2011 inflation) in the last 22 years averaging $9 billion per year. The year 2005 alone saw $51 billion in flood damages. WWND (What Would Noah Do)? Due to drought, average annual losses of wheat and corn alone vary between 100 million and 500 million bushels in the U.S.
Southern California gets most of its rain during the winter months, and it can be heavy. John Malan , a meteorologist with WISN-TV in Milwaukee says that in his first eight years in Brew Town, the city had broken one weather record or another nearly every month. In August of ‘86, he recalls, a 7-in. rain filled County Stadium, the now-defunct baseball venue of the Milwaukee Brewers (replaced by a new stadium, which claimed three lives during construction), to the first row of bleachers. In February of ‘74, the city received 50 inches of snow. Milan says that Lake Michigan does not protect Milwaukee from tornadoes, because tornadoes usually approach from the West or Southwest. What the lake does, he says, is add another dimension of variability to the weather.